In this article I would be talking about how to crack WEP encrypted wireless LAN. To start with we would require a wireless card which supports packet injection. I would suggest buy AWUS 036NH Alfa Card from ebay. It is available for less than $30. Download a image file of Kali linux from http://www.kali.org/downloads/ and install it. Plug in the Wireless USB dongle and check the inteface name for the newly inserted dongle. Lets say the OS calls it wlan1. Now start airmon-ng suite giving the following command. Identify the particular channel of the WEP encrypted transmission . Lets say its channel 1 . Switch channel to 1 . Further identify the bssid of the AP and give the following command to collect all the packets in a file from the intended AP. where NetworkName is the ESSID of the network and AA:BB:CC:DD:EE:FF is an already associated client. To accomplish the above we should have a good receive signal strength from the AP. I would recommend using a 24 db parabolic antenna for the same. This should be available for less than $30. In addition to connect the Alfa card to the antenna you would require a N Male to RP-SMA Male connector as shown below. This should cost another $5. You may require an antenna extension cable (N Male to Female) as shown if the antenna is required to be placed at a distance from the Alfa card. However, not that this would cause reduce the received signal strength. 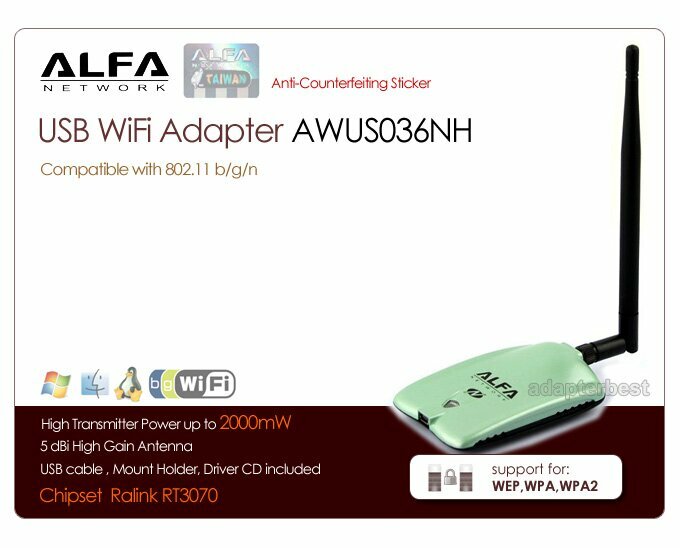 Therefore I would suggest keep the Alfa card close to antenna and use a good quality USB extension cable as shown below having a (protective metallic sheath ) to cater for the distance between your Alfa card and PC/laptop. Note : It is brought to your notice that try the above setup only networks which you own. Trying the above on a network not owned by you is not legal. A very practical article......re ally educative.